I wrote this on a Sunday morning after being out until 4 a.m. so please disregard all time references. 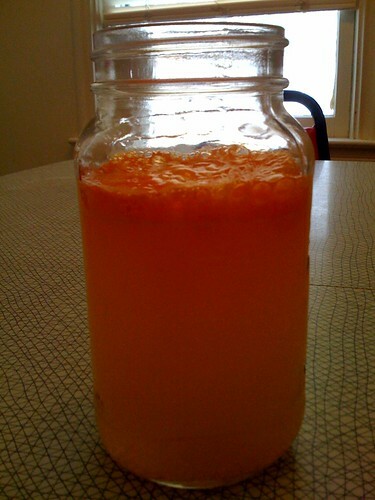 Zipfizz engergy drink mix is an orange powder that comes in an orange tube (dubbed a test tube by its makers) that my friend Stacey got for free from a local liquor store. She got it for free because she inquired about what the hell it was. The cashier apparently told her he had no idea and that she should have some for free. Obviously, this mystery tube had to be consumed immediately, if not sooner. 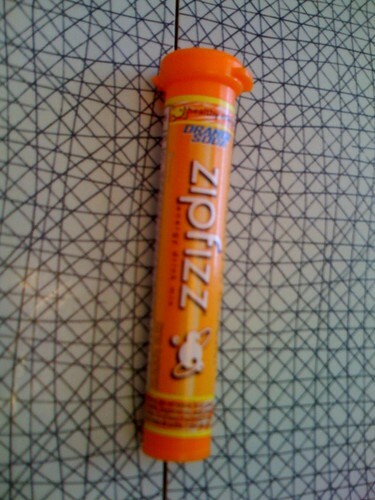 I had actually reviewed Zipfizz once before, and it was a damn good review. When it came time to publish, however, the draft had vanished from my computer. The folder it had been in even contained a file icon for it that became invisible when I clicked on it. Not being one to give up easily, I got my hands on another tube (AKA Stacey felt bad for me and gave me her second test tube of it). Then, that tube disappeared before I could review it. Lucky for me, one of my cat's treats slid under the oven this morning and when I went to extract it for him, I found the missing tube. I knew I had to review it soon, but I told myself I was too sleepy and hungover to do so today. Then I realized -- This was the perfect moment in which to put Zipfizz to the test! After some hesitation, I once again mixed the tube of "healthy energy" orange soda flavored powder into 16 - 20 ounces of water, taking note that I should not consume more than three tubes today in case I somehow managed to get my hands on more. The powder reacted in a couple minutes, leaving some stagnant nuclear orange liquid, topped wth some even brighter foam, in my drinking vessel (a mason jar some spaghetti sauce had come in). The liquid was not fizzy at all -- quite the disappointment. The taste was actually not that bad and it reminded me of either weak orange soda mixed with something creamy, or watery Sunny D.
The flavor, however, is but one piece of the puzzle here. The test tube promised me healthy energy and I would settle for nothing less. As I sipped away, I reacquainted myself with this special health powder. Ah, the good stuff. And it seemed to be working, though whether or not that was due to the famed placebo effect was unclear (this is what I had discovered during my last experiment with Zipfizz). I can't say I'd urge you to run out and get your hands on a tube, but Zipfizz was with me when my hangover subsided and that counts for something. why are you drinking out of spaghetti sauce jars? do you want me to buy you some glasses? The low-brow subtitle is no joke. Cardio Cocktail is typically made out of L Arginine, though it is commonly blended with other herbal supplement products such as EDTA Chelation or Omega 3,6, and 9. L-Arginine, an essential amino acid, is the major component for vascular protection. L-Arginine is pure 100% free form arginine and is the precursor for endothelium-derived nitric oxide (EDNO), which prevents a heart attack. Best natural hangover remedy to me is the detoxicated which contains vitamin B6, zinc, magnesium, and selenium. These critical vitamins and cofactors are consumed by enzymes involved in alcohol metabolism. So this one is really effective.